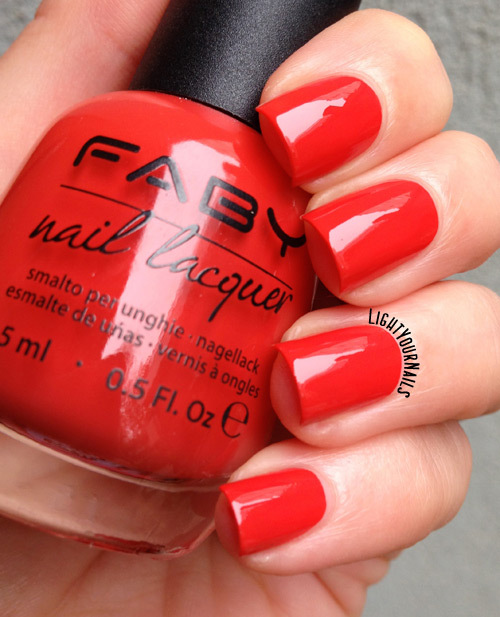 Faby Alec Wants a Carrot | Light Your Nails! Back with another shade from Faby Illusion collection for Fall/Winter 2015/2016. This is Faby Alec Wants a Carrot and although Faby says it’s a red creme I am absolutely sure it’s an orange. Leaning red, sure, but still clearly orange. Faby Alec Wants a Carrot is very easy to paint and it’s opaque in one coat. It dries very glossy, too. All in all formula is amazing, just as any other Faby shades I’ve tried so far! Two coats + top coat in my photos. Oggi vi parlo di un altro smalto della collezione Faby Illusion per l’Autunno/Inverno 2015/2016. Lui è Faby Alec Wants a Carrot e, anche se Faby dice che è una lacca rossa, io sono fermamente convinta che sia un arancione. Tende al rosso? Certo, ma è cmq un arancione! Faby Alec Wants a Carrot si stende come burro ed è coprente in una passata. Asciuga anche molto lucido. La qualità è ottima insomma, come tutti gli altri smalti Faby che ho avuto occasione di provare. In foto sono due passate + top coat. I don’t think I had an orange this dark in my stash and I love how it can make a different base than a regular red. Plus if you are peach-toned like me you’ll rock this colour! 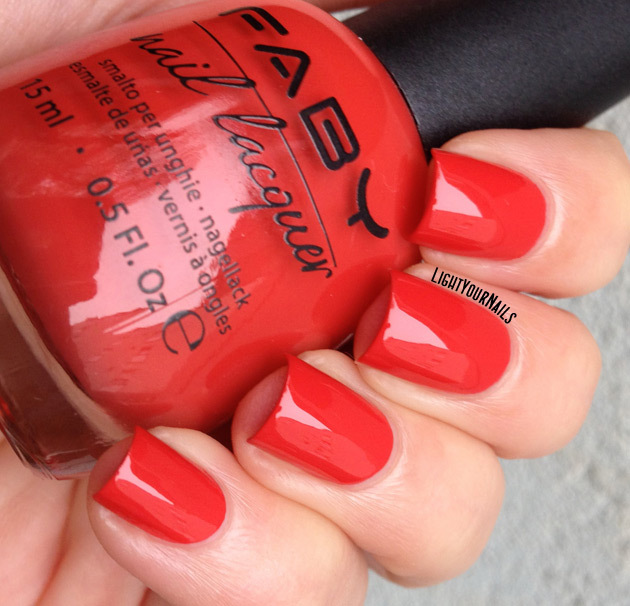 “Faby polishes are big 5 free, meaning they don’t contain DBP, toluene, formaldehyde, formaldehyde resin or camphor. And that’s not all – no Faby products are tested on animals.”. 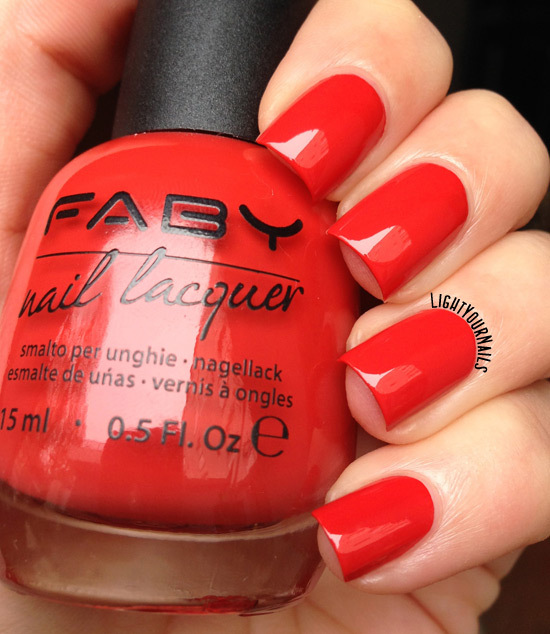 Don’t forget that Faby sells its nail polish worldwide so feel free to check with them for your local distributor! They are everywhere and very social friendly so you will find Instagram and Facebook pages for and from different countries! That’s it for today. I can’t believe it’s December tomorrow. I will try to post as many Christmas manis as possible during the next weeks! Non credo di avere uno smalto arancione così scuro nella mia collezione e mi piace l’idea di una base diversa dal solito rosso. E poi se avete un sottotono pesca come il mio questo colore vi starà benissimo! “Gli smalti Faby sono Big 5 Free, ovvero realizzati senza l’utilizzo di DBP, Toluene, Formaldeide, Resina di Formaldeide e Canfora. Non solo, nessun prodotto Faby è testato su animali.”. Gli smalti Faby sono disponibili sulla boutique online e presso molti centri estetici, con una rete in continua espansione. Faby è anche molto presente sui social, specie Facebook e Instagram, quindi non dimenticate di taggarli quando postate foto coi loro smalti e seguiteli per tutte le novità! Per quanto riguarda me invece oggi vi saluto qui. Non riesco a credere che domani sia Dicembre. Cercherò di postare più nail art natalizie possibili durante le prossime settimane! Its finish looks great. I suppose I'd like this brand. This is such a gorgeous creme. Seriously flawless! Wow, this looks like such a smooth and amazing shade! I definitely to try it out for stamping. Thanks, it's an orange though! You are definitely rocking this shade to say the least. It looks so creamy and beautiful! That color looks lovely on you!! that red is so hot. Thank you Nichole! It's actually an orange! I looooove this, it is so bright and beautiful and it looks freaking amazing on you! I just recently received a bunch of Faby shades! Love how glossy and smooth they are! Ah yes, I love all mine! Che potenza questo smalto! Non ho nulla di simile temo, è un arancio davvero particolare, mi piace!